Mana means a person, place or thing imbued with spiritual power (see definition in wikipedia). In times when store shelves are overflowing with products that have been mass-produced and imported from across the world, Mana Pottery continues to handcraft pottery infused with the mana of a life lived mindfully within the sacred Aravaipa Wilderness. Over the last six decades, deep in the heart of Aravaipa Valley in southeastern Arizona, Mana Pottery has been producing unique and stunning American Southwestern art. Multi-colored, hand painted renditions of desert life on handcrafted earthenware provide an inspiring visual feast in the context of everyday functionality. Each step in the production process requires attention to detail to ensure that there are no flaws in the finished piece, which is twice fired to temperatures exceeding 1900 degrees fahrenheit. The workmanship that goes into each piece is the meditation of three artists: Immanuel (Mana) Trujillo, who has been making visionary art for sixty years, and Anne Zapf and Matthew Kent, who have been making Mana Pottery for 30 years. Immanuel “Mana” Trujillo is the heart of Mana Pottery. A World War II veteran who suffered a bomb blast that caused traumatic brain injury and PTSD, Trujillo was transferred in 1948 to a hospital in Fort Sheridan, Illinois. Here he discovered an empty crafts room and began developing a career that would span the next 60 years. Trujillo actively participated in Native American Church (NAC) ceremonies for over ten years before separating from the NAC to start his own Peyote Way Church. He trained in all the offices of the NAC, including Fireman, Drummer, Cedar Man and finally as Road Man in 1962. During those ten years of service and learning, he made many Peyote ceremonial vessels. He met Timothy Leary in 1962 and introduced him to the NAC tipi ceremony, often called the Red Road or Road Meeting. Later Trujillo introduced artist Salvador Dali to Leary’s legendary Millbrook in New York. Trujillo was instrumental to the success of the “Summer of Love” in Denver, Colorado, where he had a studio for several years. Mana Pottery was legally incorporated in 1984, seven years after the 1977 arrival of apprentices Matthew Kent and Anne Zapf. In 1978, the three incorporated the “Peyote Way Church of God, Inc,” and two years later accomplished 501(c)(3) status for the Church. Until 1984, all work produced was offered for donation or sold wholesale to Goldwater’s Department Stores, Red Feather Lodge in Grand Canyon National Park, Arizona, and other small gift shops across Arizona and New Mexico. Mana Pottery ceremonial earthenware was also sold at Ortega’s in Scottsdale, Arizona, for ten years. Mana Pottery studios has trained many artists in the creation of earthenware art, including Adam and Claire Dorn of Maw Paw Pottery, Barbara Clark of Cascabel Clayworks, and many others. 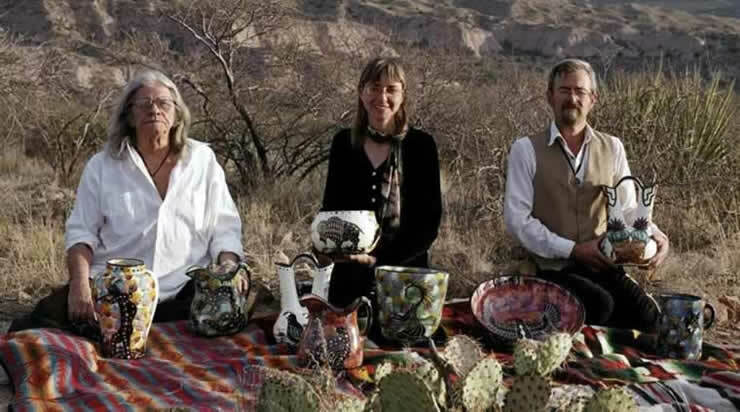 Mana Pottery is the financial arm and secular vehicle of the Peyote Way Church, a Peyotist Church that is open to all. The Church promotes the sacramental use of Peyote and its conservation, a holistic lifestyle based on the Word of Wisdom, compassion, selfless service, the recognition of the female as the giver of life, and family oriented cottage industry. Mana designs are inspired by our sacrament, our work environment, and our Word of Wisdom lifestyle. The “Peyote Way” line is featured in the Smithsonian’s Museum of the American Indian Collection. Barry Goldwater was a collector and carried Mana ceremonial earthenware in Goldwater’s Department Store from 1959 for over twenty years. The pottery is coveted by private collectors like Whoopi Goldberg, Lucy Lawless (Xena, Warrior Princess) and Bill Walton of Oregon Trail Blazer fame. Mana Pottery is also currently used in prayer meetings by other Peyote communities.